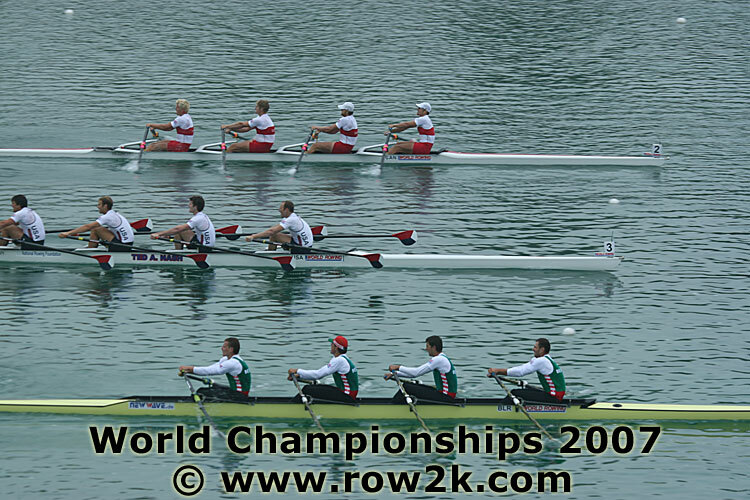 Sloan DuRoss ’95 and Deaglan McEachern ’01 have finished their first two heats at the 2007 World Rowing Championships in Munich, Germany. Both DuRoss and McEachern represent the United States in the Men’s Quadruple Sculls event, DuRoss in bow seat and McEachern in two seat. On Monday, in the first heat against Egypt, Ukraine, Czech Republic and Argentina, the quad finished third behind Czech Republic and Ukraine. While the top two finishers in each of the four heats qualified directly for the semifinal on Friday, the remaining eleven boats had to row in the repechage races on Wednesday in order to qualify for the semifinals. On Wednesday, the U.S. boat raced against Belarus, Canada, China and Croatia, needing a second-place finish or better to qualify for the semifinals. In a photo-finish, the quad qualified in second place over Canada only 0.26 seconds behind them. The quad will compete in the A semifinals on Friday for a shot at the finals on Sunday. Check out a video of stroke seat Mark Flickinger’s thoughts on their repechage at Row2k or download it direct here (22MB). In other news, FISA announced that three Russian rowers were banned from the regatta (and a further two years of competition) for “intravenous infusion,” an illegal practice according to FISA’s anti-doping rules. As a result, the Russian Lightweight Men’s Double Sculls (LM2x) and Women’s Eight (W8+) will not not race anymore in the regatta, and therefore also lose their eligibility to row in next years Olympic games for those two events. Read the full report at WorldRowing.com. On the whole, the U.S. team is in the running for the finals for every single event it entered except the Lightweight Men’s Double Sculls. This includes 86 athletes in 26 crews, some of whom are competing for spots on next year’s Olympic team. Good luck to Sloan and Deaglan, and all the athletes representing the United States! View further results live at the FISA website. 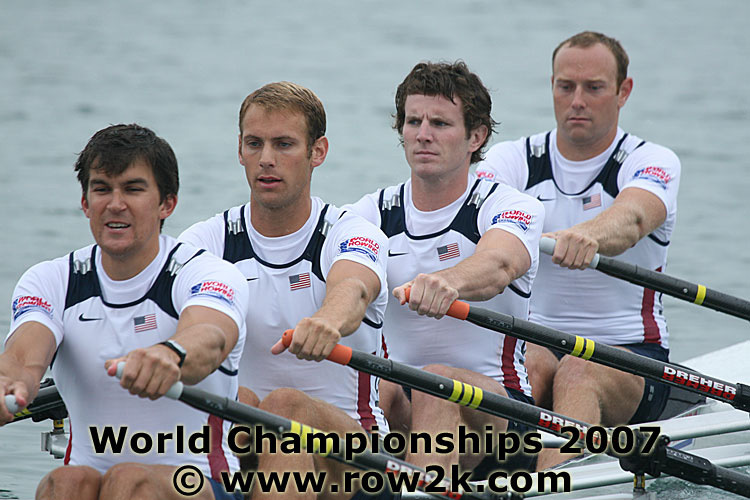 Photo and video courtesy of Row2k.com.